It’s officially the autumnal equinox, and what a wonderful way to celebrate it’s arrival than a beautiful evening party at the Benedictine Sisters Monastery Teaching Garden! Last Friday we were treated to a lavish spread of delicious food, violin music by Michael Francis Haley, and a very informative and entertaining class (by flashlight) with Capital Naturalist Alonso Abugettas. The evening was so lovely; you could here an orchestra of a of chirping insects and croaking amphibians, bats were busy keeping the mosquitoes at bay and the hundreds of tea lights and candles made for perfect lightening. The tables were elegantly set with flower arrangements by Nancy Berlin (and others), tables of savory and homemade appetizers, and scrumptious desserts. There was so much attention to detail and it was evident that many people worked hard planning and setting everything up. Most of all, it was a delight not only to see people from your own MG class, but also meet others that you had not met before. It really was a splendid evening in the beautiful setting of the Teaching Garden, and true to it’s description, the White bed was in full “moon glow”. Thanks to Tina Chappell (chair of event), the MGPW board provided funding, Paige Thacker (who did SO much), Nancy Berlin and the support of Brenda Hallam, Linda Ligon (and her husband Tom), Terri Anderson, Sally Peterson, Val Chappell (Tina’s husband). If I have forgotten anyone, let me know! I will add their names. I also would like to give a HUGE shout out to all the Master Gardeners that faithfully come out every week to keep this beautiful garden and composting going. Please come out and see us more often! Alonso Abugettas was the guest speaker and he has agreed to speak again on June (details coming later…..) Alonso is a well-known local naturalist, environmental educator and storyteller in the Washington, D.C. area. He is the natural resources manager for the Department of Parks and Recreation and the co-chair for the Beltway Chapter of Region 2 of the National Association for Interpretation. He has been trained as a master gardener, was made an honorary Virginia Master Naturalist for his role in starting two chapters and serves as an instructor for both. 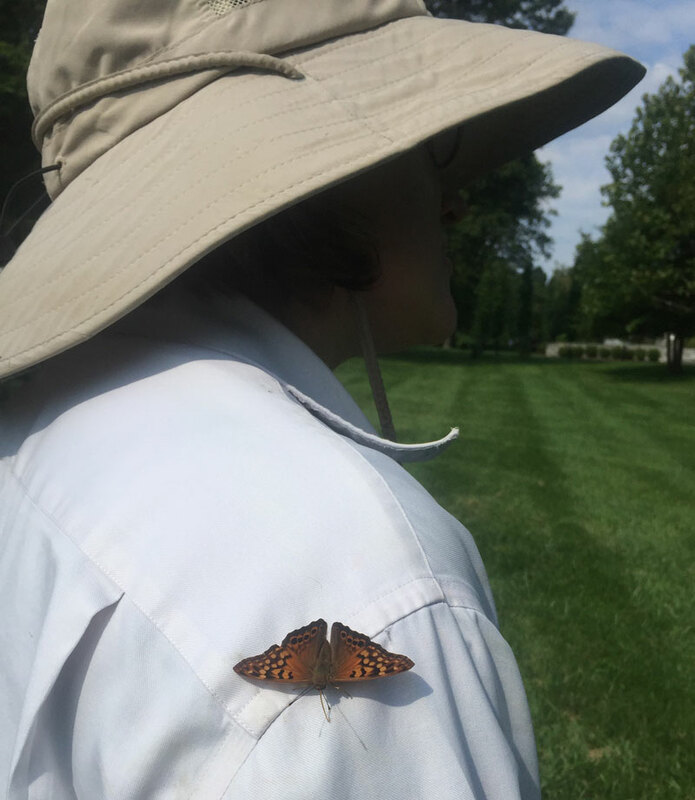 He is a co-founder of the Washington Area Butterfly Club and has held several offices, including president, for the Potowmack Chapter of the Virginia Native Plant Society. He invites you to check out his personal blog “Capital Naturalist” and Facebook group where he posts regular nature notes using his own photography. Alonso took us out into the garden after dark and found lots of interesting things going on in the Lesley’s Deer Resistant bed. The Teaching Garden is designed to support pollinators in all of the beds, but special attention is paid to Monarchs. Throughout the season we find all stages of metamorphosis and for the last several weeks the generation that leaves on the long migration to Mexico has been emerging from their chrysalis’. Monarch catepillars have been munching away on the many milkweed plants planted to attract them. Alonso found them of course, busy consuming as much as they can. He also found many other stages in the life cycle of beneficial insects we have been supporting, as well as the sticky aphids that supply honey dew. 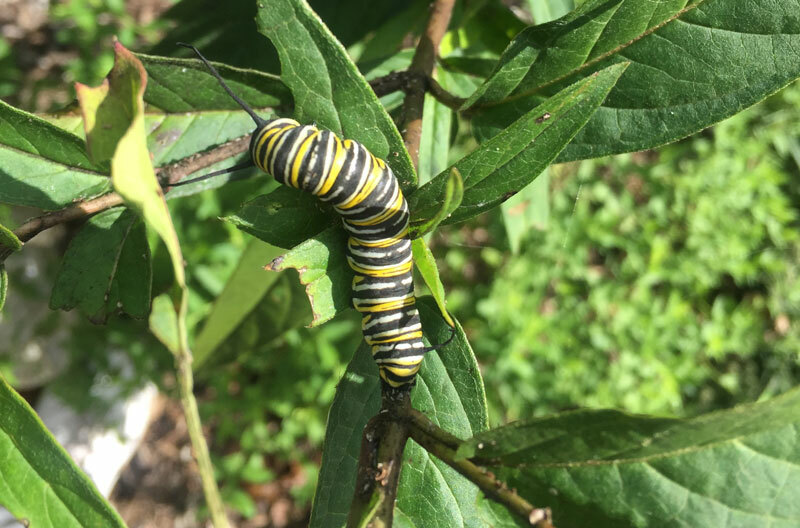 Some of the things that Alonso talked about: There are 13 species of milkweed found in Northern Virginia, aphids found on milkweed are not native, but are native to oleander bush, and the Monarch caterpillars that we saw that evening are probably at least, the 3rd or 4th generation this season. We learned to cut back the milkweed in late August to encourage a new flush of leaves to feed the last generation before migration, to wash the aphids we find off with fresh water, and that young milkweed leaves are edible. Alonso also found plenty of milkweed bugs and lace wing nymphs eating aphids. One interesting we also learned is that if a catepillar bites directly into a vein of the milkweed, the latex can glue its moth shut! Please come again! We love to see everyone. Thanks again to all that worked hard to make this a special evening! There is a story that’s been growing in raised bed four. It contains all the good elements of storytelling; a dynamic and beautiful main character that has the ability to heal and provide nourishment for the hungry, while remaining trapped in a 4×6 fenced space in the middle of a beautiful garden setting with the unfortunate problem of being mostly forgotten. In her desperate need to be noticed, she creates beautiful, brilliantly colored flowers, grabbing the attention of all who enter the garden, but as these flowers fade, so does the attention she receives. Alone again, she produces long, green pods which over time begin to fade to brown and crackle in the wind, as she herself comes to the end of her season. Yet, she leaves one last gift—jewels! 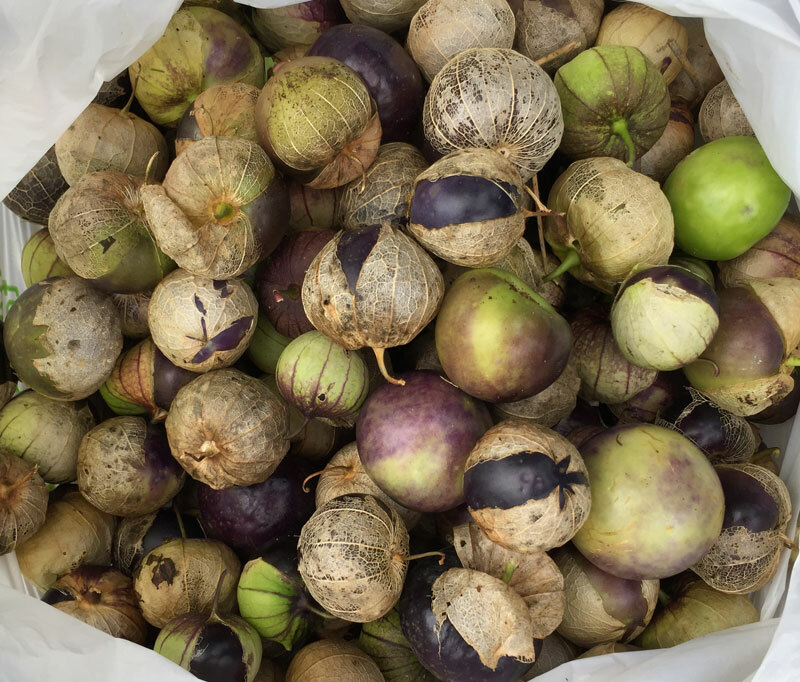 These purple-speckled jewels are edible and contain a nutrient packed inside. Who is this heroine that gave so much, in return for so little? 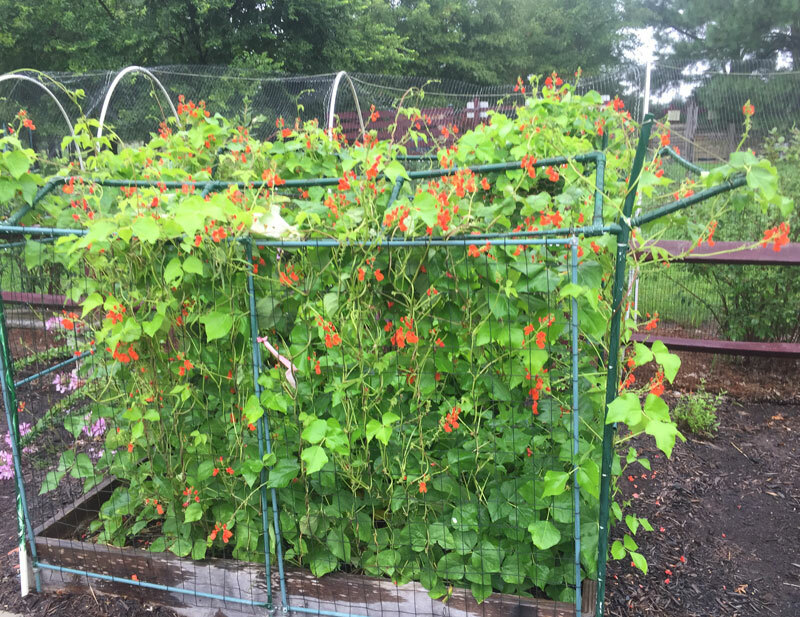 Her name is Scarlet Runner Bean, and she became part of the Teaching Garden story in late May when we still had an empty raised bed in need of planting. In 2016 this bed grew tomatoes and okra, something we did not want to repeat in the same area. After spending all spring prepping and planting the bio beds and other raised beds, we were mostly looking for a plant that would keep the soil covered during the summer months and not be something we would have to fuss over. 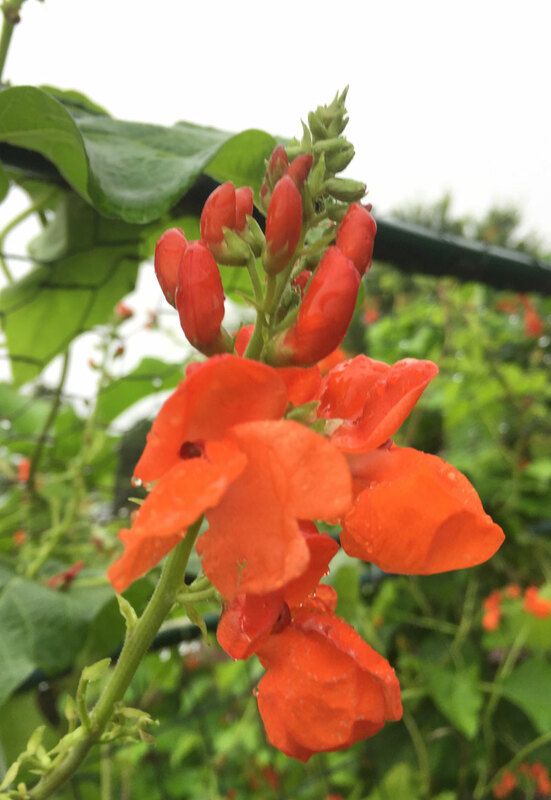 Thomas had Scarlet Runner Bean seeds available, and it was quickly decided we would grow these beans for its legume nitrogen fixing soil benefits, and not necessarily for the harvest of beans. As the above story goes, we truly did plant and forget…okay, we did water, but that has been the extent of our efforts. This plant has thrived, filled, and spilled over its caged area. There have been many happy pollinators zipping in for visits, but no bad bugs to be found threatening its welfare. By mid-summer it burst into flames of brilliant, crimson colored flowers, which I imagine would look beautiful in a vase arrangement. Green pods followed, but most of us were not fans of eating them raw. 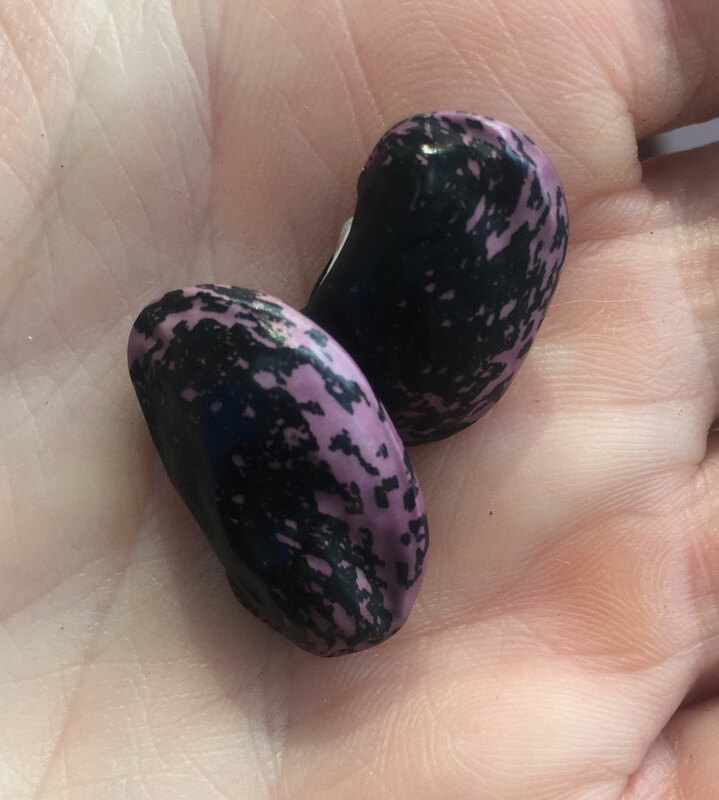 So we left the plant alone again, only to come back and find gorgeously colored dried beans inside the now brown pods. This story will end after we have harvested enough of the dried beans to use in a recipe. Fortunately, there are a couple of Master Gardeners with some amazing cooking talents who might be willing to help write the last delicious chapter. If you would like to recreate this story in your own garden, here is a link to a good read with more detailed information. The White Bed is a very unique and beautiful garden tended by Master Gardeners Nancy Hanrahan and Spencer Williams. Nancy is on sabbatical this season, so Spencer has been taking great care of it, in addition to the Rock Garden. The White garden provides four seasons of interest using a combination of perennials, annuals and bulbs. Using a monochromatic color scheme, the overall effect is achieved with contrasting flower form and leaf shape, color and texture. A White garden is also a clever way to brighten a shady area and works well as a “moon garden” with flowers that are open and fragrant at night. This garden is a symmetrical oval, with pairs of identical species on adjacent sides. This design has been a study in how differing microclimates can affect individuals of the same species, as the sides receive differing amounts of light and shade. When you look at the White Bed you see this oval and plants arranged symmetrically. In the center there is a white Clematis and white Lilies. White Phlox, white Daisies, and white Echinacea are next to the Clematis on both sides, also giving height to the center area. One side of the center piece side is a tall, variegated Euphorbia, that may eventually thought be removed since it self seeds, and is aggressive. It does add very distinctive foliage and texture to the bed. Other perennials and annuals moving outward from the center and in a symmetrical pattern include white mums (a favorite of the deer), Stokes aster, white Roses, white Iris, Mule grass, tall white Salvia, dwarf white Salvia, white Catnip, and at the ends, Lambs Ear. Spencer has added white flowering annuals such as Snow Globe throughout the summer. This bed is considered a full sun garden, but there is some shading at different times of the day from trees. What is interesting to observe is the different growth habits of identical plants receiving differing amounts of sunlight, in this symmetrical design. Since this season has had a fair amount of rainfall, Spencer has not watered it much. The deer have been consistent visitors to all the beds, but in the White bed, they mainly dine on the flowers of the mums. They prefer some of the tasty treats in the other beds next door! Legumes are found in the plant family, Fabaceae, (also called Leguminosae) the third largest plant family on Earth. An enormous and incredibly diverse family, these plants are the most common family found in the tropical rain forests in the Americas and Africa. They range from rain forest to deserts, lowland to alpine habitats. There are even some aquatic species. Legumes are grown worldwide and are a rich protein source for human and livestock consumption. In agriculture, legumes are grown for the grain seed, called the “pulse“, and these dried seeds are harvested for livestock, forage or silage. Legumes are also grown for human consumption and green manure. Important legumes include alfalfa, clover, peas, beans, chickpeas, lentils, mesquite, carob, soybeans and peanuts. Lupines, a famous wildflower in Texas, and a common landscape plant, is also a legume. 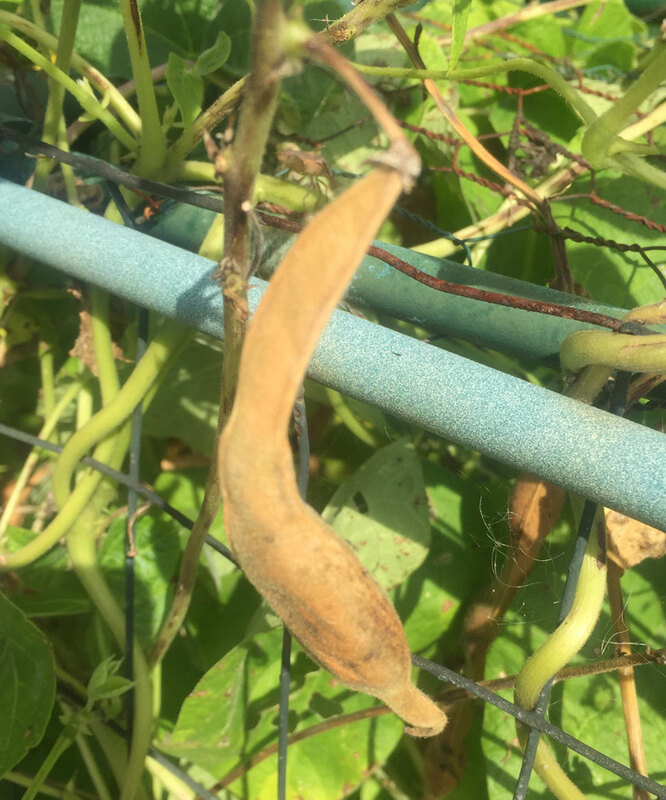 There are also some undesirable legumes which are invasive species such as kudzu and wisteria vine as well as poisonous legumes to cattle. Legumes are not always an herbaceous plant and can also be trees. The Brazilian Rosewood, Honey Locust, Black Locust, Acacia, Red Bud and Honey Mesquite are examples of legume trees. Leguminosae is divided into three major subfamilies, each having a huge range of biodiversity. They can be identified by the pinnately or palmately compound leaves, (although some have simple leaves), flower parts are usually in 5”s, but some are in 4’s, they have axillary branches, they may be covered with small hairs, or no hairs (glabrous), and most have dry, seed “pods” that split into two pieces. The vast majority of legumes have symbiotic nitrogen fixing bacteria in structures called root nodules. This important bacteria (Rhizobium) fixes atmospheric, molecular nitrogen (N2) into ammonia (NH3), then into ammonium (NH4), a usable form by the legume plant. This form of nitrogen is used by the plant to make amino acids, which are combined to make protein. Important in the ecosystem as well as agriculture, ammonium is then converted into nitrate (NO3) by aerobic soil bacteria, a usable form by all other plants. In agricultural practice, legumes are used as an organic way to amend the soil and reduce crop nutrient deficiency. Planted as green manure, they used as cover crops and are tilled into the soil in fall and spring. The plant material breaks down quickly and releases valuable nitrogen back to the soil. High in protein, legumes are the second most important source of human food and animal forage. It is believed that legumes evolved somewhere around 35-54 mya, with “nodulation” (infection with nitrogen fixing Rhizobium) evolving shortly after. It is believed early humans foraged on the rich source of plant protein from legumes growing in Africa. Legumes have been cultivated by man for thousands of years. Archaeologists have found evidence of pulse production in the Punjab region of India dating circa 3,000 BC. Evidence of lentil cultivation as been found in the pyramids of Egypt and dry seed pods have been found in a Swiss village dating back to the Stone age. As an excellent food source, seeds from legumes are typically low in fat, have no cholesterol, and are high in folate and thiamin. Seeds from legumes are an excellent source of essential minerals such as phosphorus, copper, manganese, magnesium and iron, and are also a good source of riboflavin and vitamin B6. They contain beneficial fats, soluble and insoluble fiber, and are an excellent plant-based protein source and healthy substitute for meat. They contain a small quantity of mostly unsaturated (healthy) fats, and contain complex carbohydrates giving them a low glycemic index. The U.S. Dietary Guidelines for Americans recommends eating about 3 cups of legumes, including beans, per week. If you eat about ½ cup of beans every day, you’ll meet the weekly Dietary Guidelines for legumes. 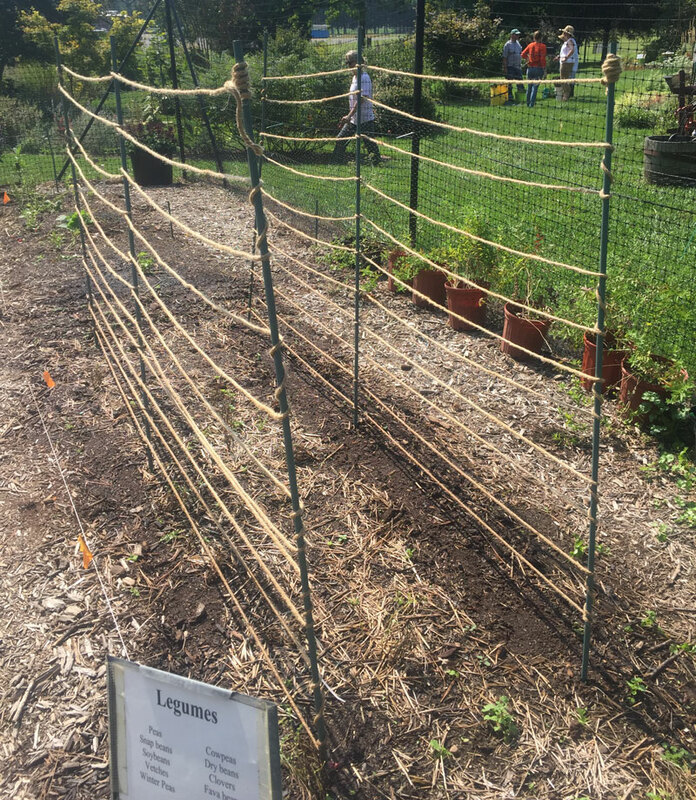 At the Teaching Garden, Hairy Vetch and Crimson clover are used as a winter cover crops in the Cooks’ Garden beds and are turned over in the spring as green manure. 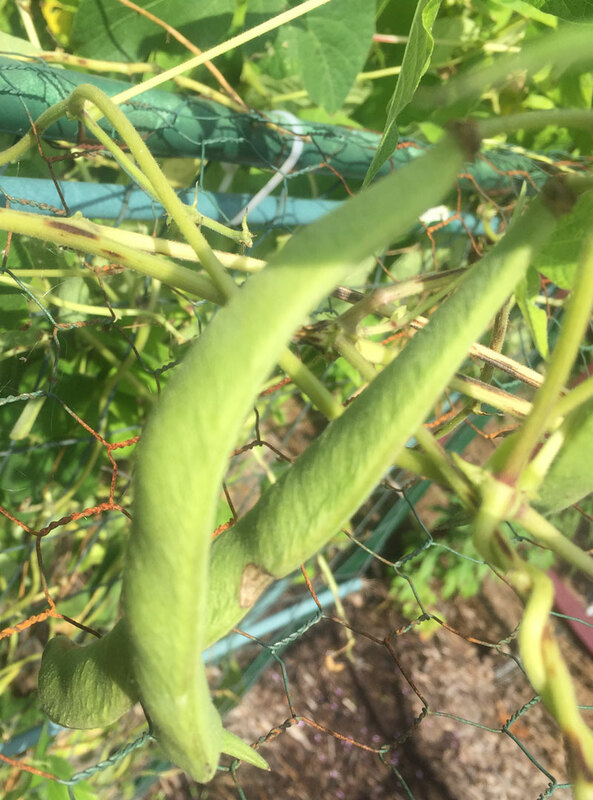 Other legumes grown throughout the season are Scarlet Runner bean, Provider bean, sugar snap pea, and chick pea. Charlene with her delicious Lentil Balls. Check out her monthly recipe collection for Legumes! Today we continued the garden ritual of harvesting, weeding, and watering. We also took a peek under the sweet potato protection fencing to see how things are growing. We were surprised to see there were no big tubers bursting from the soil, and concluded this is most likely the result of the wet and cooler summer; sweet potatoes like it hot! So this prompted the decision to change the vegetable topic for the October 21st Saturday in the Garden (SIG) from sweet potatoes to garlic and brassicas. Charlene will be putting together another recipe book, so make sure to send any favorite recipes that include garlic or the brassica family her way. This past SIG was especially sweet with getting to sample Charlene’s chocolate pea pods. 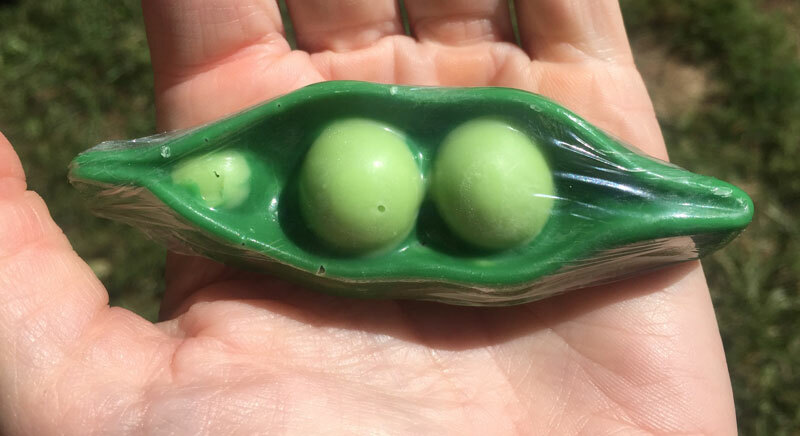 I think every child would eat up their legumes if they grew like that. 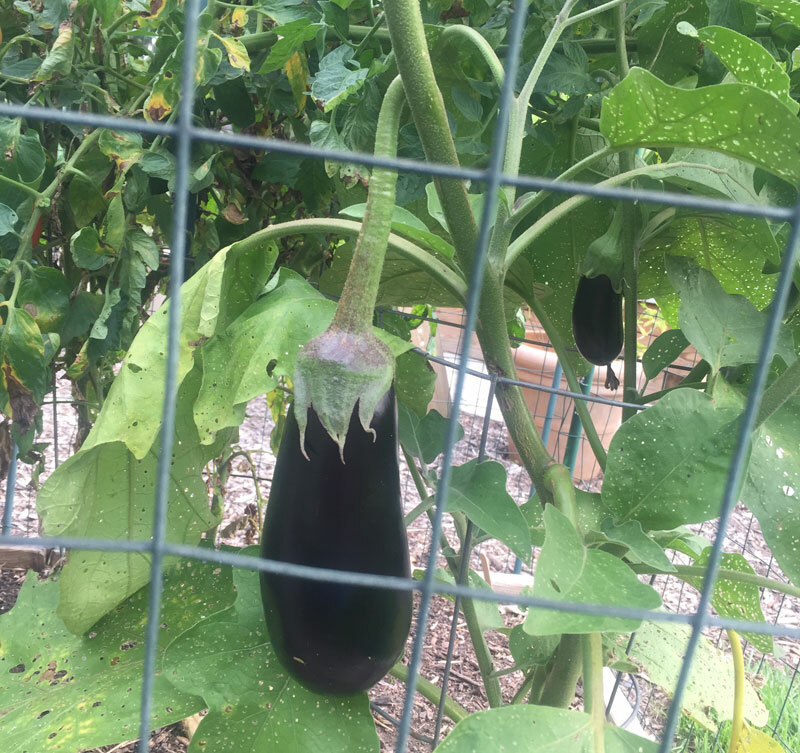 Visual treats around the garden included: monarch caterpillars in Jannell and Karen’s native bed; a honeybee taking in the menu on the Bee, Butterfly and Hummingbird garden sign; and beautiful, unblemished eggplant dripping off the plants in Jannell’s raised bed. Enjoy your week and all the visual treats it has to offer. A change in season can be just the pick-me-up needed to renew one’s spirit, outlook and feel invigorated to tackle new tasks. Out at the Teaching Garden there has been a lot of talk about nature’s way of showing the gardener that fall is approaching. Master Gardener Robin Finehout wrote and posted an excellent write up on this very subject. Her shared research has me noticing signs of fall in my own garden. In the vegetable garden one of the biggest signs fall is approaching stems from the activities of the gardener. Row covers and trellis are erected for cool loving crops like broccoli, cabbage, and snow peas. Seed packets of lettuce, spinach, turnips and kale once again share a spot with the garden tools. The dying vines of squash and cucumber plants are removed and those areas are prepped with rich compost and covered with seeds of crimson clover and rye. 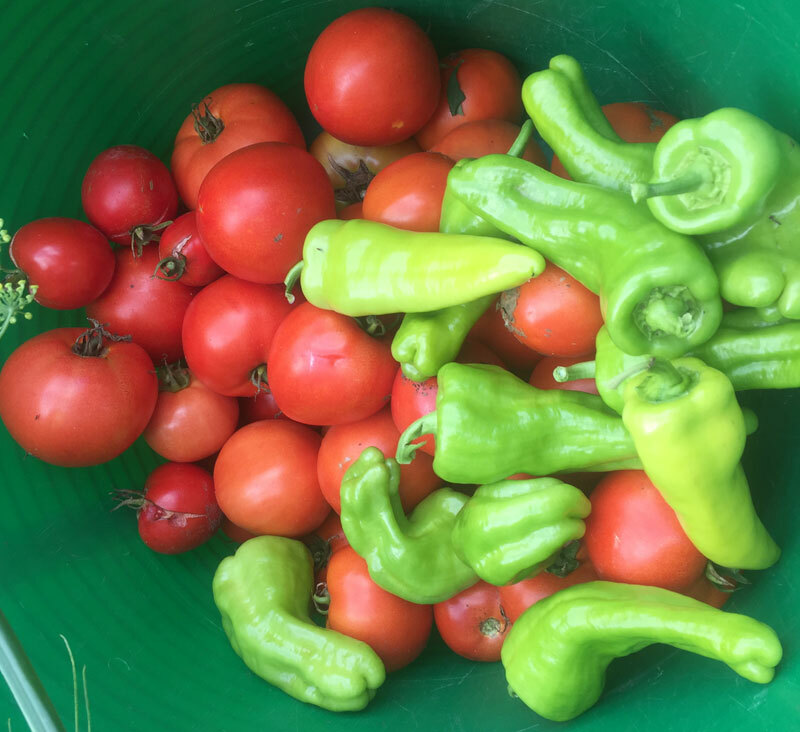 More time is spent harvesting the flush of tomatoes, peppers and tomatillos. All these activities occurred this morning at the Teaching Garden. We are ready for fall, and with brilliant green cilantro springing up in the corner of the garden, all on its own, the veggie garden is telling us it’s ready for fall too. We all look forward to the cooler temperatures of autumn and it is exciting to see these changes in our gardens! Driving out into Fauquier and Loudoun counties we can already see maples starting to change color, and the hay fields are a beautiful crimson color. Thistle, aster, goldenrod and sunflowers can be seen along the roadsides as well as ripening fruit of sumac. All the walnut trees in Middleburg seem to be covered in fall cankerworm! Depending on the local weather, we can often see these changes in the beginning of August. This year, we did not experience the drought conditions often seen in our area in late summer, so changes we are seeing are probably due to the change in daylight (actually, night time) hours. High pressure, continental air masses have been sweeping down from Canada bringing us the cooler and drier days, with fair weather cumulus clouds. These changes in temperature trigger senescence and dormancy. Insects and animals also detect these changes, and prepare by storing energy for the winter or migrating. Some of the signs I have been noticing for a week on my walks are the gradual break down of chlorophyll in sassafras, poison ivy, and Redbud. Chlorophyll a and b start to break down, leaving red (anthocyanin), yellows (xanthophyll) and orange (carotene) pigments. These pigments gather light at different wavelengths to make that last bit of carbohydrate for the plant. My woods are filled with the sounds of dropping pignuts, black walnuts, and acorns, and squirrels are busy burying them in the middle of the yard. The young neighborhood bucks are still hanging out together and the velvet on their antlers is noticeable. I have noticed the hummingbirds are particularly competitive at the feeder, trying to store as much energy as they can before migrating. Sumac, wild grape and pokeweed berries are ripening and the annual return of ragweed is in full force. The Teaching Garden is also showing lots of changes. The Echinacea in the beds have gone to seed and died back. Switch grass is beginning to turn red and Amsonia is starting to turn yellow. The Woodlands dogwood leaves are changing color, they are setting fruit and the Nachez Crepe Myrtle is peeling, and also setting fruit. In the the Woodlands, Toad lily is now blooming, as well as Ligularia. 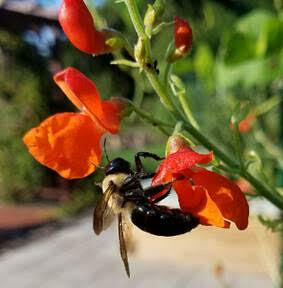 The Master Gardeners have been sending lots of pictures of Arachnids and insects getting ready for fall. One of the most intriguing Arachnids has taken up residence in the drought tolerant bed, the Yellow Garden spider (Argiope aurantia). These spiders are active in late summer and early fall. Known for their large web up to 2 ft across, early fall is the time of year when the female mates and then eats the male. The spider’s eggs overwinter and spiderlings hatch in the spring. Her large, circular web has a characteristic vertical, zigzag shaped “stabillmentum” in the center. A nightly ritual is to consume the circular center and rebuild it each morning with fresh silk. This spider is non-aggressive, rarely finds her way indoors (by accident) and prefers garden areas. The gardeners have also seen an increase in adult Praying Mantis getting ready to deposit their eggs in a frothy secretion that hardens into a case. These cases are attached to twigs, leaves and fences and stay protected from predators and severe winter weather until spring. We have also seen many butterflies this summer, and many of the gardens have milkweed for the Monarchs. Monarchs begin their annual migration in August from all over North America, to Mexico to overwinter. Some scientists believe this migration may be as old as 10,000 years, beginning around the end of the last glacial period. The earliest reports recorded are from the 1860’s, in California. Monarchs will only lay their eggs on milkweed, and during breeding season, will have up to 4 broods. The largest population is found in the fall, when they are getting ready to migrate. This migratory generation are the great, great grandchildren of the ones that left Mexico last spring. In Mexico, they cluster in a 2 acre area in the mountainous Oyamel fir forests, where they are bathed in moisture from fog and clouds. 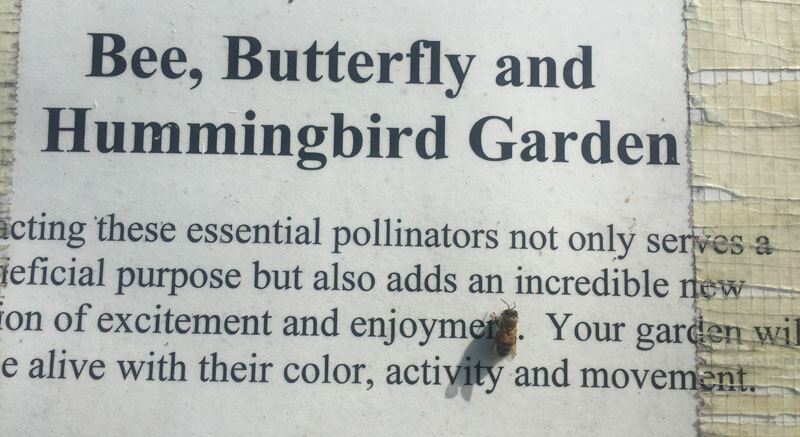 In the Bee, Bird, and Hummingbird garden, Teri Madden tells me that she is still seeing adults and caterpillars. By the road side, Milkweed bugs are also feeding. Not harmful to Monarchs, they do compete for resources. If you see them in your Milkweed garden, just pick them off and give them a swim in the “swimming pool”. Never spray pesticides! A few of the gardeners have seen Woolly Bear and Blonde caterpillars already. Folklore has it that the ratio of black to red on the Banded Woolly bear (Pyrrharctia isabella) is an indicator of the severity of the upcoming winter. There has actually been some scientific studies to correlate these two things that found (maybe) some evidence, but for now, its mainly considered an old wive’s tale. We do see more of them this time of year because they overwinter as a larva, and go searching for protected sites under bark or inside cavities of rocks and logs. They can be seen traveling pretty fast to get across the road! Whatever your favorite things about fall are, its always fun to mark these changes every year! Some see the back to school supplies in the middle of summer, the yellow buses practicing their routes, pumpkin lattes offered at coffee shops, mums, pick your own apples, or the last episode of Game of Thrones. Master Gardeners celebrate the (almost) end of weeding, (especially Japanese Stiltgrass), squash and vine ripe tomatoes, and planning for our next years gardens! Happy fall everyone!